The verse today relates to the previous. There are many dangers which we must be constantly watching out for. Whether in business (such as banks) or personal life, we have to make sure we are not being taken advantage of in some of our dealings. For example, suppose you have a friend who is always helping others financially, and he always asks you for help with a promise to repay. Over time you learn that he never makes good on that promise. To help in such matters, you can ask him for something valuable as a way of urging him to repay. This item serves as a reminder of a debt that is owed. This passage has little to do with spiritual matters, but there is another debt in our lives that a constant reminder. In Exodus 20 and Deuteronomy 5 we find a list of things called the 10 Commandments. In Romans (specifically chapter 5), Paul tells us that the Law, the 10 Commandments, was given as a reminder of our sin. It shows us how we fail to live up to loving God. The Law shows us our debt. Fortunately, our God has shown us grace and forgiveness. He paid our debt by sending His Son, Jesus of Nazareth, to live a perfect, sinless life and die on a cross to pay the debt we could not pay. To receive the full grace and forgiveness He has offered us, we need only believe that Jesus is God made flesh, paid for our sins on the cross, and rose again to life and now lives with the Father awaiting the time to return and redeem His faithful. Heavenly Father, help us to be good stewards of what You have given us. We admit we are sinners in need of grace and forgiveness. Thank You for offering that grace and forgiveness through Your Son, Jesus Christ. Give us the faith we need to live in the light of that truth every day! This is the third verse in a row in which Solomon focuses on the lazy, with one more to follow. For some reason Solomon is really hammering home the point about laziness. I simply can’t imagine a person so lazy that he is unable to lift food from a dish to his mouth, but the point being made here about laziness is that it is completely unacceptable. Right now in the UK we have a government that is trying to deal with a culture of living on benefits that appears to have become the norm for a proportion of society. If you believe the politicians and the press we have families where more than one generation has never worked in this country. While there are obviously other reasons for unemployment than laziness, the fact remains that there are folk who are quite happy to sit back and live on handouts. Some even call these handouts their wages! That is quite an insult to those who have worked and paid taxes all their lives. My third son James graduated from University in 2009. He decided to spend a year working to save money to add to what he had already saved so that he could take a masters degree. He got an invite to live with his eldest brother and his wife, and set about looking for work. Having worked two jobs while studying for his BA he thought that this would be a simple matter. It wasn’t. Recession had kicked in and there wasn’t much work around. He refused to claim benefits and carried on searching, doing jobs around the house to compensate his brother and sister-in-law for feeding him. It took a few weeks, but James found two part-time jobs. He had to leave those jobs to return to University but managed to start another job before he completed his masters. Now that impresses the pants off me, not just because James is my son, but because he has shown what is possible despite the dire condition of the economy. I am proud of my son for not choosing the path of laziness. 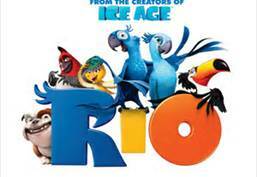 In the movie Rio, Blu is a blue macaw with a human friend, Linda. Blu is the last male of his kind, and he is sought out by an ornithologist from Brazil, Túlio, who intends to take the bird back with him to save the species. Linda is convinced by Túlio to travel to Brazil with him and to take Blu to meet the other bird. While they are there, Blu and the female macaw, Jewel, are bird-napped and sold to three men who are bird smugglers. The leader of the group plans to sell the birds for an insane price and therefore become rich. A very long journey takes place to try and get back to Linda, and Blu and Jewel escape and everything turns out just fine. However, the thieves didn’t plan on their way of income literally flying away from them. After all, the birds were locked up in a cage! It’s like this movie was made for these verses! The thieves were so concerned with their wealth, they didn’t stop to consider losing it all even when they thought they were set and everything was working to their advantage. When you have wealth, do not set your eyes on it and continue to weary yourself to get more. Money is losing its value at an alarming rate, and even the wind can carry it away if you are not careful. 2 and put a knife to your throat if you are given to gluttony. Most if not all people who read this live in or were born in a so-called First World nation. These are the wealthiest and most technologically advanced nations. The standard need of the average citizen here – food, clothing, shelter, etcetera – is usually met. In fact, today’s passage is probably more of a warning to you if you live in one of these nations, than it is a warning for someone from a Third World nation – a nation of extreme poverty and lack of advanced technology (though they usually have cell phones!) However, it is a warning for all people who have wants and desires. Everyone wants their children to have a better life than they had … or at least a better life for themselves, so there is always a desire for better circumstances. However, look at many lottery winners or those who receive large inheritances. They end up bankrupt and sometimes worse than before. The reason is simple: they fall in love with MORE! They see how nice it is to always have food and things, and they simply want more. Gracious God, protect our hearts from a love of more of the things and money of this world. Rather, please give us a heart for righteousness, godliness, faith, love, patience, and humility! True victims should be pitied and cared for; those with a victim attitude should not. Oh, we should care, sure, but there comes a point when people need to quit blaming their lack of progress on others. I know what it is like to lose everything. I know what it is like to go from making good money to having to work multiple jobs just to feed my family. But many will not lift a finger for themselves, while all along condemning those who have worked for what they have. They live as victims of their own laziness. Just the other day I overheard a conversation a manager was having with an employee. The manager tried to encourage the employee to seek a better position in the company, but the employee would not accept. The reason she gave was that if she moved into a better paying position she would lose some of her welfare benefits. She would rather live on what was given to her than work for anything. Look at the working man. Look at what he is doing and how he is doing it. He is diligent, which means he does the best he can as promptly as he can. He cares about his work, no matter what that work is. There once was a waiter at a particular restaurant. One day the restaurant changed their menu and began offering Pepsi instead of Coca-Cola. When a customer was saddened by the change, the waiter went around the corner to a convenience store, bought a Coke, and brought it to the table. He was diligent in his business. Not long after the Pepsi/Coke incident we discovered the waiter had left the restaurant! When we asked where he went we were informed he had been promoted – to manage his own restaurant! When a person wants to get ahead in life, the last thing he needs is to be invisible. Look at the man who does his best and works hard – look at the man who hones his skills and fine-tunes his gifts – and you will find a man who gets noticed. If you want to be considered worthy to stand in the presence of kings, do work that is worthy to be noticed by kings. Don’t be a victim – be a victor! You will get noticed.